Circa 1934. Once used as monastery, this 13,000-square-foot French Normandy mansion rests on 20 acres. Extensive gardens are lush with apple orchards, tiered gardens, herb gardens, reflecting pools, Japanese maples and cherry trees. It is in the National Register as a rare example of Norman-style architecture in the United States. The inn's inviting drawing room boasts egg-and-dart molding, sofas and drapes in an English cabbage-rose print and floor-to-ceiling French windows. The dining room has a white marble fireplace, Parisian chandelier and Oriental carpet. Ask for the VIP Suite for a king bed, white marble fireplace and double whirlpool showers. Payment Types Accepted Include Discover, Travelers Checks, Personal Checks, Master Card, Diners Club, Visa and Gift certificates. This property has 8 total guest accommodations, 6 with private bath, 1 with fireplace, 6 suites and 3 conference rooms. The types of beds available include Double, Queen and King. French Normandy estate nestled in the middle of 15 acres with woodland vistas, English flower gardens, vegetable gardens, and large mature shade trees, and walking trails. Locally sourced and/or organic food, cleaning products, laundry, and pest control. Surrounded by mature woodland trails with English gardens, large original fountain, rock walled terrace landscaping, outdoor seating and lounging provided on upper terrace, beautiful French espalier apples and pears surronding house and gardens, English flower gaden, kitchen vegetable garden and koi pond. Very large, spacious suite done in Ralph Lauren floral rose print, fireplace, beautiful view of gardens and grounds, marble bathroom, large jet tub for two and separate shower. Spacious luxury suite, well appointed with French down sofa, tapestry wall hangings, gold leaf mirrors, beautiful views of the property, six large windows allows for beautiful, soft daylight, double vanity, tub/shower. Sleigh bed with well appointed English decor, masculine tones, balcony view, and in-suite original bathroom. Old world charm, floral walls, writing desk, reading chairs, in-room sink, views of the estate's gardens and fountain. Charm, charm, charm, four-poster bed, geranium print wall coverings, soft plush carpet, make-up vanity, and in-room sink. Geranium and Lilac rooms are adjacent with access to private seating area and full bathroom. Third floor quiet, very large suite with in-suite bathroom, desk, reading area and two comfortable chairs. French twall decor, small cozy bedroom with area view of back gardens and fountain, intimate quiet third floor suite, very large marble bathroom with double vanity, full tub/shower, and jet/spa tub for two. Traditional French-Normandy manor bedroom with window seating reading nook, soft neutral tones, floral decor, and in-suite marble bathroom. Greencrest Manor was built in the 1930s as a French Normandy Manor by George R. Burt, son of Michigan lumber baron Wellington R. Burt. He and his wife, Nellie Zinn vowed to build a home on their favorite picnic spot, overlooking St. Mary's Lake. In the course of purchasing the property, Burt passed away. His widow fulfilled their dream by completing the structure in the authentic French-Normandy style and surrounding it with extensive formal gardens. In the early 1960s, the estate was purchased by the Catholic Church and for nearly 20 years it was used as a seminary. Tom & Kathy have done a great job restoring this place and with the grounds. They are also eager to cater to special requests. What a fun time! For those of you fortunate enough to have spent time in the English countryside, you will agree that there is a certain charm and feeling that one gets. Those same feelings were resurrected when we stepped foot onto the the grounds of Greencrest Manor. The exterior is a complete throwback to the English and French bed & breakfasts and the grounds offer the perfect canvas for any amateur photographer. The lack of current popular amenities (computer, television, etc) allow the guests to truly escape from the outside world. This is the perfect weekend getaway. My husband and I felt like we were back in England when we stayed here. The Manor and grounds are beautiful and well-kept, we enjoyed wandering them to look at all the detail. Our room was comfortable and we loved the jacuzzi tub. Breakfast was amazing. Definitely recommended for a romantic getaway or a group outing. Greencrest Manor is a wonderfully situated bed and breakfast. Nestled in Southwest Michigan, it boasts beautiful gardens, comfortable accommodations, and a great location. My husband and I have stayed here on a few special occasions and were treated like royalty. Tom and Cathy (owners) bent over backwards to make our stay as pleasant as possible. The whole mansions is kept immaculately clean and each room makes its own statement in decor. We will visit here time and again! During the warmer months, take a walk around the grounds. There are wonderful surprises everywhere! If you are looking for a destination, visit Binder Park Zoo. They have a great variety of animals and it's a nice day trip. It is also reasonably priced. I've been in Normandy many times, I've never seen anything like your "French Chateau". This place boasts an amazing and unforgettable stay. The members of the staff are absolutely amazing, the manor is as breathtaking as any place we have ever been and our time spent at the establishment is one that we will always remember with absolute joy. We have already bragged to and enchanted our friends with descriptions of the manor. I can't believe a place so gorgeous and straight out of a fantasy tale is hidden in our home town, and we can't wait to visit again. What a completely splendid experience! I love this place...as soon as your pull up the drive you feel like you left Michigan and arrived in the french country side. My husband and I have been going here for many years and got to know the innkeepers very well and feel very much like a part of their family. We have stayed in most of the rooms and can pretty much say they are all wonderful but our favorite is the Trumpiet Suite. When ever we go we always bring a bottle of wine (always to share with Tom and Kathy)some cheese and fruit and just enjoy the ambience that the inn as to offer. It is definatley a place you don't want to miss. Can't wait to go again..It is a stay that you will never forget. If you love to be surrounded by beauty and luxury, you must treat yourself to a stay at Greencrest. Fashioned after a castle from Normandy France, this beauty is 5 stars all the way. Imagine waking up to the smell of baked goodies as you lay in your luxurious bed and take in the gorgeous decor that surrounds both inside and out. It is our favourite get-away for a taste of France without having to embark on a long plane ride. The owners Tom and Kathy make you feel so welcome. If visiting in the summer make sure you take a walk thru the amazing gardens and relax by the lovely fountains on the property. Winter time at Greencrest is beautiful. Relax by a fire (some rooms have their own) while enjoying time in the many sitting areas located thruout the home or walk the snowy trails in search of deer tracks. You'll be guaranteed to find some, and if lucky you'll spot them enjoying this amazing property too! I bring clients to Greencrest Manor to experience my Pressure-Free Living transformational seminars and retreats. The peaceful, world-class atmosphere is so ideal. 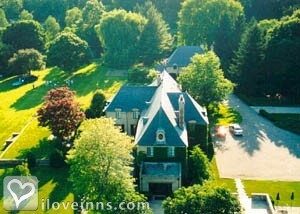 My clients leave in awe of the beauty of this romantic, European-style inn right in the heart of Michigan. My husband and I had our wedding reception at Greencrest Manor over 20 years ago and continue to visit. The guest rooms are comforting and beautiful. The grounds are well kept and invite you to a stroll across all the areas. The common rooms fit the bill whatever you are looking for. My favorite is the library with a fire. Greencrest Manor is truly a love story as it was rescued from ruin by Tom and Kathy 25 years ago. They have lavished the manor with their time and talent to create a stunningly beautiful and comfortable retreat. My husband and I first visited Greencrest more than 20 years ago for our anniversary and we have been back many, many times over the years, by ourselves, with famiy, and with friends. We will be returning in a few weeks to celebrate our 40th anniversary with our children and I cannot wait. Greencrest is stepping back into the era of gracious country homes, where you are invited to spend a few days, and where you are totally pampered by Tom and Kathy, by the beautiful rooms, and by the gorgeous grounds. A Peaceful and Romantic Inn ! We have been coming to Greencrest Manor for the past 20 years! It is our escape to the country to rekindle the romance in our lives as a couple that has been married for 35 years. Tom & Kathy's attention to detail when entertaining is more than excellent..it is superior! You need to experience type of luxury! We have spent several nights and weekends at Greencrest Manor in Battle Creek. 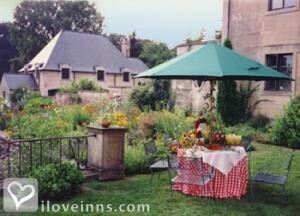 It for sure is the best Inn we have ever stayed at and it is a romantic setting and place. Kathy and Tom have always been so good to us when we have been there. Everyone should give it a try.